No people, not cereal thief. We’re not talking some kooky, Coco Pops-addicted maniac running out of the Kelloggs factory with milk streaming down his chin, unfortunately. Instead, we’re talking serial thief, as in someone repeatedly committing the same offence over and over again. Caught on CCTV in Washington DC, the hapless shoplifter has been spotted dozens of times casually walking out of the petrol station with handfuls of items. While staff were distracted, he’d grab snacks and drinks and just walk out without paying. Amazingly, he’d keep going back to the same store. This time, however, staff were wise to his moves, and locked the door as he tried to escape, again with handfuls of items. After trying to get out, talking to staff, and then pleading with them, the crook eventually tries to break his way out by running and kicking at the door. After smashing the glass in the door to make his escape, I think it’s safe to say the guy won’t be back in the store again, no matter how much he wants his cereal. 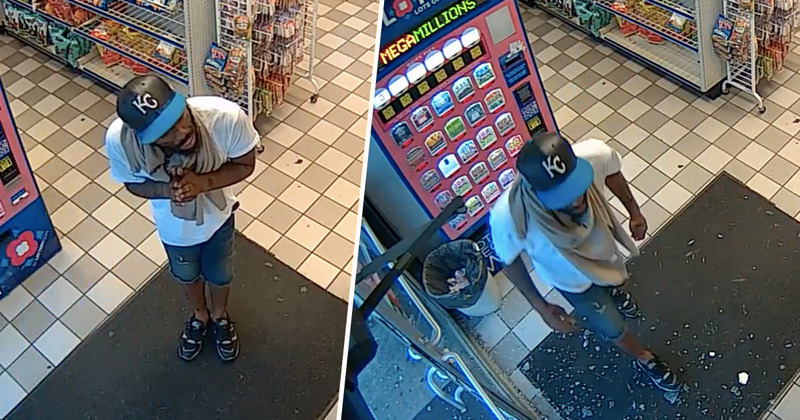 As this guy was known as a serial thief at the gas station, it seems karma took her time catching up with him. She was probably too busy doling out instant karma – a much more satisfying result for the innocent bystander. Such as with these two who tried to steal a motorbike in London recently. As the video shows, one tries to stand up to a passerby who tries to intervene, grabbing a hammer and initially scaring him away. On first impression, the man concedes defeat. I wouldn’t want to go up against a man with a hammer and I’m not sure anyone would? A few seconds away from the scene, the passerby had the opportunity to stop and think about things – how he could still do something, as well as the fact mopeds are no match for cars. Realising they’ve been busted and the police are almost certainly on their way, the two hapless criminals try to scarper off. Satisfyingly, however, our passerby in the silver car returns, reversing towards the thieves quicker than Captain Marvel punches old ladies. Although one of the thieves runs off, the reversing silver car smashes into the moped, just as the other criminal jumps off. The driver of the car immediately gets out, presumably to phone the police, as the driver of the moped gives up on his two-wheeler and makes a run for it himself. In another great move by karma, the hero’s headlight actually starts working again after the thief has hit the car with his hammer – almost as if the universe wanted to reward the driver’s heroic intentions. Thankfully, the criminal got what he deserved after the man in the silver car reversed into his bike. If he thought he could steal someone else’s motorbike, then he certainly didn’t deserve his own!